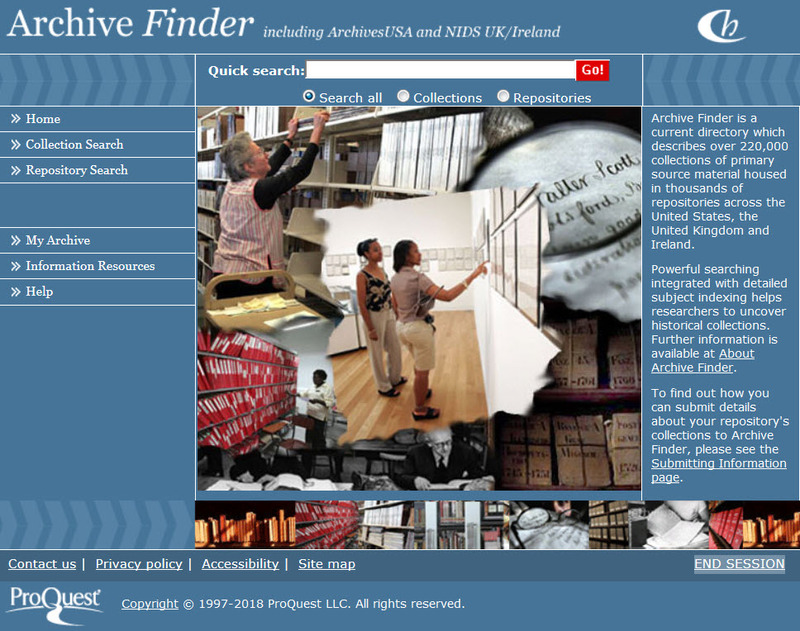 Archive Finder brings together ArchivesUSA and the cumulative index to the National Inventory of Documentary Sources in the UK and Ireland (NIDS UK/Ireland). ArchivesUSA is a current directory of over 5,600 repositories and more than 175,000 collections of primary source material across the United States. NIDS UK/Ireland is a major reference work that reproduces on microfiche the finding aids to thousands of archive and manuscript collections in libraries and record offices, museums and private collections throughout the UK and Ireland. Used together in Archive Finder, researchers are able to read descriptions of a repository's holdings to determine whether a collection contains material useful to their work as well as find the information they need to contact the repository directly. Repository records provide detailed information including phone and fax numbers, hours of service, materials solicited, email and home page URLs when available. Each collection record links to its corresponding repository record, simplifying the research process. The entire collection of NUCMC from 1959 to 2009. The National Union Catalog of Manuscript Collections (NUCMC) includes information gathered and indexed by the Library of Congress, covering 115,000 collections. Only Archive Finder makes all of the historical NUCMC fully searchable in electronic form. Names and detailed subject indexing of 72,000 collections whose finding aids have been published separately in ProQuest UMI's microfiche series, National Inventory of Documentary Sources in the United States (NIDS). Names and detailed subject indexing of over 47,000 collections whose finding aids have been published separately in ProQuest UMI's microfiche series, National Inventory of Documentary Sources in the United Kingdom and Ireland (NIDS UK/Ireland). Collection descriptions submitted directly to us from repositories. A growing number of more than 6,000 links to online finding aids. Detailed indexing of collections allows powerful searching across eight combinable fields. Users can zero in on material relevant to their research.